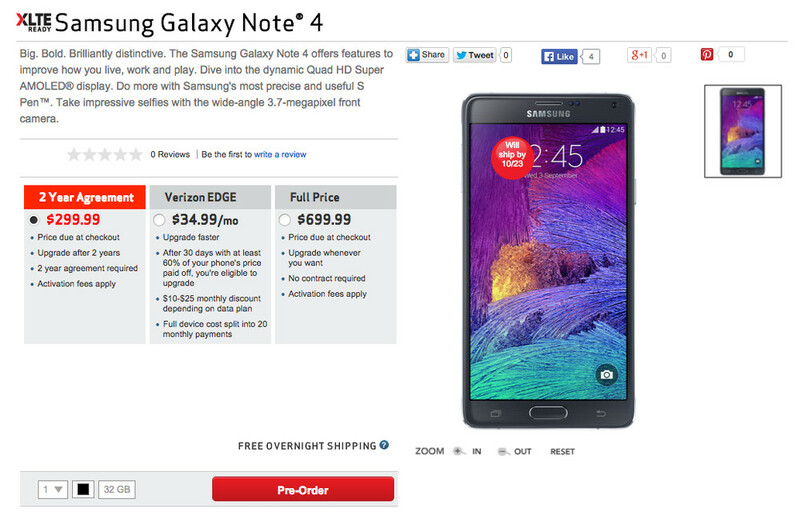 The Samsung Galaxy Note 4 is now up for pre-order from the two biggest wireless carriers in the US. Both Verizon and AT&T went live with pre-orders late last night, so if you are ready to become one with the newest version of Samsung’s oversized phone, the time is now. Well, sort of now. This is just a pre-order, which means you won’t get your phone until October 17. But you get that already. I’ll stop rambling. The links for each are below. Verizon appears to only be selling the black version at this time, whereas AT&T is offering either black or white. The on-contract price remains $299, like all previous Notes. If you choose a different payment route, things get a little wonky depending on which carrier you choose. Verizon will get you into the Galaxy Note 4 for $34.99 per month for 20 months if you choose their Edge payment plan, or $699 if you want to buy it up front. AT&T has two payment plans available of $34.42 per month or $41.30, with the difference in price happening because of upgrade times. 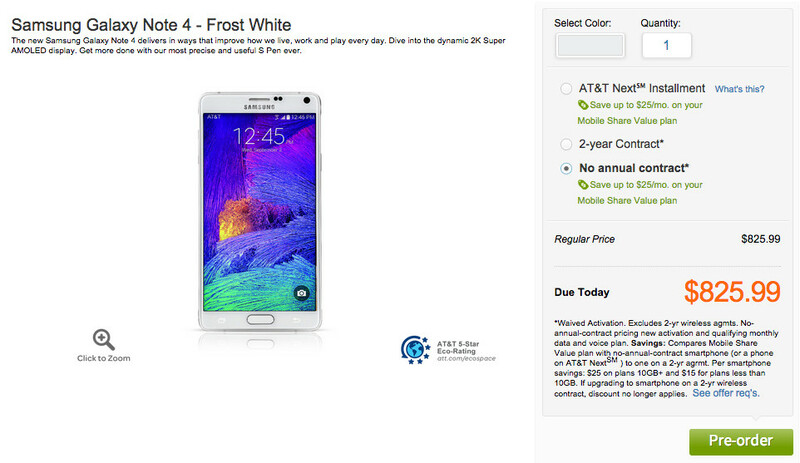 If you want to buy the Note 4 at full retail from AT&T, they are currently listing it at $825.99. That, is insane. Don’t forget to catch up on Galaxy Note 4 news if you have not already. Here is how it compares to the new iPhone 6 Plus, Samsung’s official introduction video, and our hands-on. Question of the Day: Has Hardware Design Reached a Plateau?